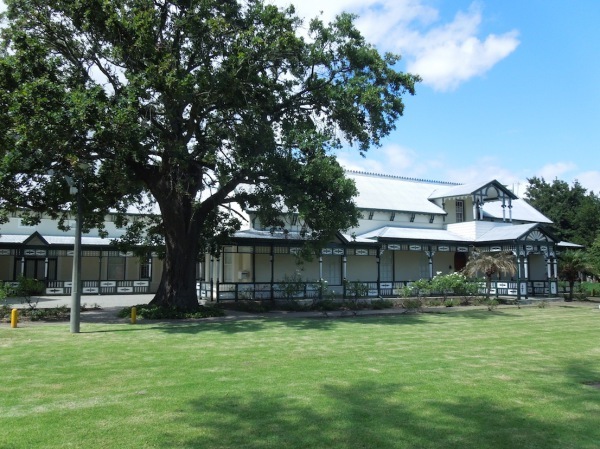 "H-shaped 5-bay homestead with clipped gables and corrugated iron roof with cast iron cresting, fretwork barge boards and decorative eaves brackets. The end gables have round vents, with a masonry stair to the rear gable. Front facade woodwork to the main house and first addition on the left, with its slightly lower roof, is Georgian: 9x9 sashes with internal shutters and a 4x4 door with sunrise fanlight. The facade has an elaborate timber verandah with fine columns and brackets, frieze and balustrade, with a double storey portion with two decorated gablets over the front gable. The addition also has a central decorated gablet. A further Victorian addition, set back from the front facade, has rough plaster with smooth quoins and surrounds to the 2x2 sashes and French doors.Formal front garden." 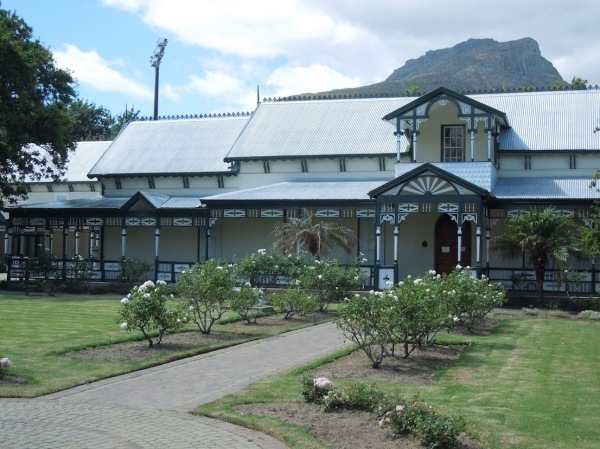 "The farm was granted in 1693 to Dirk Coetzee, the first deacon of the Stellenbosch Dutch Reformed Church, who had been living there since 1682. Paul Hartog owned it from 1747-1789, and probably built the present homestead. In 1833 it was transferred to PJ Marais, and the present facade woodwork dates from this time. The house was Victorianised in 1893 by the well-known architect Anthony de Witt. It was transferred to his sons, FRL and JH (Jannie) Marais, in 1903. The latter's bequest of 100 000 pounds made possible the founding of the University of Stellenbosch. (F&C, M&vH)"
Setting in sports fields retains rural character.